The momentous achievement resulting from 25 years of developing the divine center in her perception, closes the second development period of the Christian Science, which may be recognized as the ten-year period between 1881 when the seal of the divine crown was placed onto the textbook, and 1891 when the crowning 50th Edition of the textbook resulted from her two-year revision of it, that brought it more fully into line with the city foursquare structure that John had described in Revelation 21, as: "coming down from God out of heaven, prepared as a bride adorned for her husband." 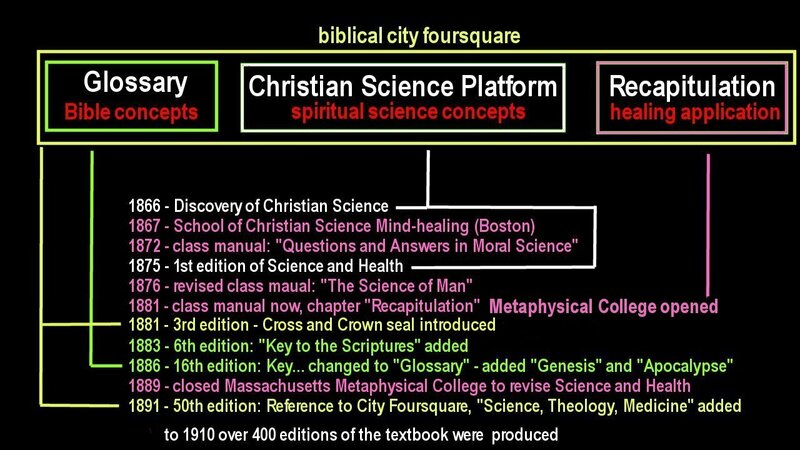 Initially, the Christian Science textbook, Science and Health, became the effective platform of Christian Science. In later editions, beginning with the 3rd Edition a formalized platform was developed that appeared as a Chapter of the book. The Platform was dramatically expanded from the 48th Edition to the 50th Edition, where it now appeared in 32 parts, to match the "City of God" with 2 parts per element, and appeared incorporated into the chapter "Science of Being". With the 50th Edition, the "City of God" was fully on the table. The 50th Edition heralds a new phase in the development of Christian Science, the phase of church-building.